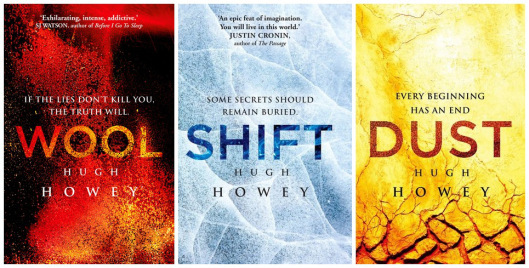 ★★★★★ If you liked Desmond in LOST, stuck in a hatch while some mysterious disease ravaged the land outside, eating an endless supply of canned food, finding strange maps hidden in secret places, then you’ll love Wool, Shift and Dust by Hugh Howey, collectively known as the Silo Saga. It is full of mystery, and it handles that mystery far better than LOST ever did. Where LOST side-stepped every weighty question about the purpose of the hatch or the island itself with a cop-out ‘feel-good’ final season, the Silo Saga does not. It delivers on its mystery, every bit of plot and mythology thunking home across the three books like massive gears in one almighty machine, clicking back the lens of the world again and again until finally we see it all, understand it all, and see Hugh Howey‘s vision on the immense scale it really possesses. Yet the story begins small, claustrophobically so. In fact it began with a short story, Wool, self-published for only 99 cents, telling the story of a depressed sheriff in an underground silo of 10,000 people, where the greatest crime is expressing a desire to go outside, and the greatest punishment is having that desire fulfilled. The sheriff wants to leave, and resultingly is sent outside to ‘clean’, like endless numbers before him, and endless more to come. Clad in a special suit that can briefly withstand the corrosive atmosphere outside, armed with a number of wool (hence the name) scouring pads, he has to clean the cameras that allow those below to have a glimpse of the wasted world without. To say anymore is to give spoilers that will ruin the joy of experiencing the puzzle of Wool for yourself. After reading the short story I was wowed, running over all the details Howey had given me and trying to figure out why things were that way, what could possibly have caused that particular set of circumstances to arise. In the rest of Wool, four more ‘short stories’ of increasing length, Howey begins to show his wider world, and we glimpse what is possible. 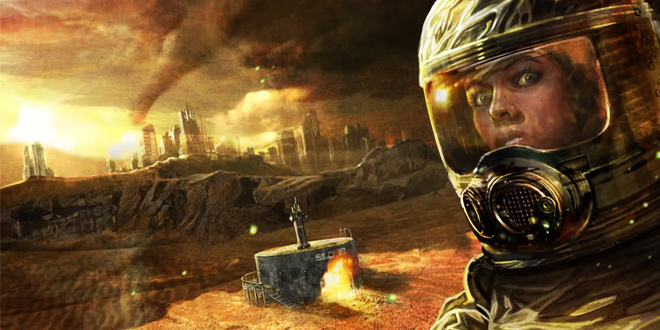 In the sequel Shift the focus widens massively, and we begin to see the full scope of this interwoven silo conspiracy. In Dust, most everything is resolved. Wool, Shift and Dust are excellent books, full of fresh puzzles and original ideas (or better renditions of older ideas, a la Desmond) that are almost always delivered upon, and delivered in a very satisfying way. After every reveal I wondered what could possibly come next, then something new came. This is a saga about ruins, and mad people living in ruins, and the shell of a grand and ruinous dream slowly creaking to its infernal conclusion. What else can I say without spoiling it? The writing is taut and clear, the characters tough and hardy if somewhat archetypal, but it’s the series of revelations and the underlying idea that make the Silo Saga sing. I was left with only one dangling strand by the end, one plot point that was never fully addressed (a clue – 50). Perhaps though that too will be addressed in one of the many other works set in the silo ‘world’, as Hugh Howey has opened up his mythology like a sandbox for other authors to play in. Already there are numerous stories available, and the legend can only get deeper. I may even read some of them myself. If you haven’t read them yet, you should. Here’s a link to them on amazon.